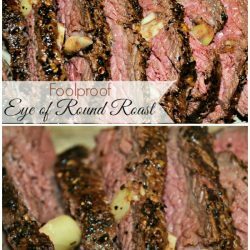 One of my favorite cuts of meat is the eye of round roast. That might sound odd to some of you because it is known to be a tougher cut of meat. But, if it’s cooked right – the texture of it is anything but tough. And the flavor? Oh wow. The flavor of it is why I keep coming back for more. 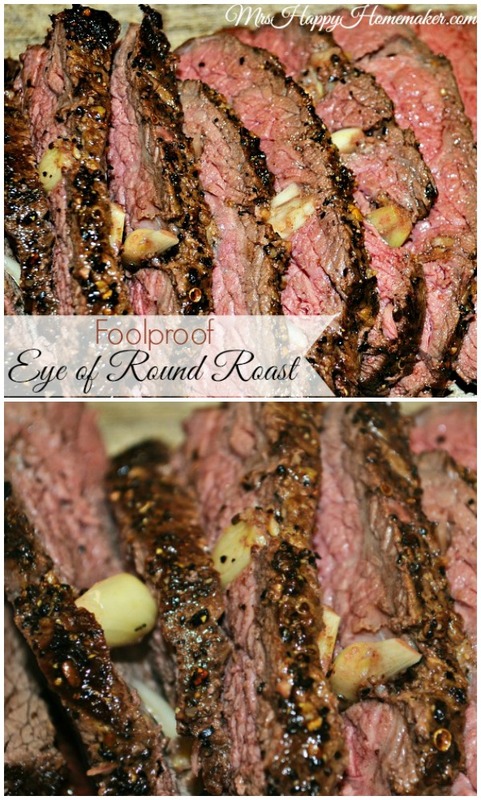 I am going to share with you today my *tried and true* method for cooking an Eye of Round roast. If you follow these simple steps, your roast will come out perfect each and every time. 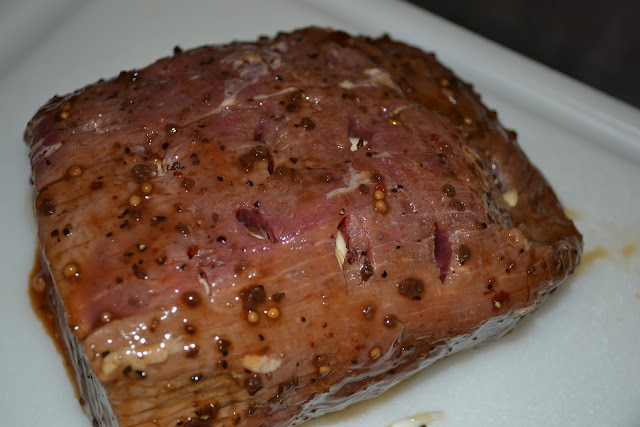 Poke holes all in the roast with a fork or meat tenderizer like I use. Marinate it in the steak marinade in a resealable plastic bag overnight in the fridge. When ready to cook, drain the marinade off with a colander. 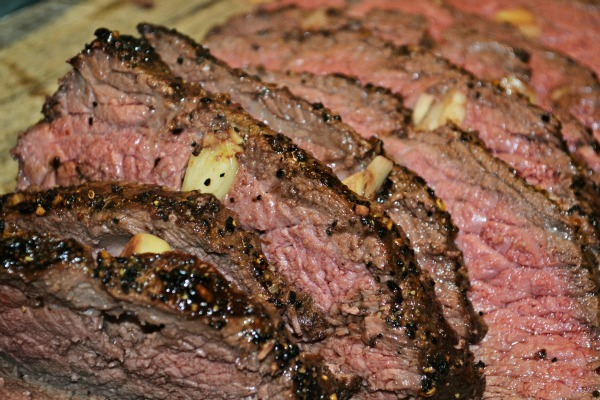 Using a sharp paring knife, cut deep slits all over the roast. Stuff those slits with garlic cloves. Sprinkle the roast with steak seasoning. Heat the butter in a pan over medium-high heat. Sear the roast on all sides. Transfer the roast to a rack in your roaster. Sprinkle with additional steak seasoning if desired. Place your meat thermometer in the thickest part of your roast. I LOVE this oven safe digital thermometer that you can place the probe inside the meat – and leave the other part out of the oven. The alarm sounds when it has reached the temperature that you set it for. Cook the roast in an oven preheated to 250 degrees until the meat reaches an internal temperature of 130 degrees. 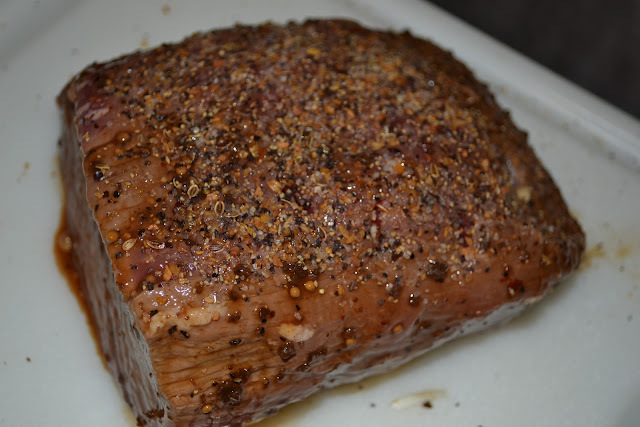 Remove the roast, and let it rest for 15-20 minutes before slicing. Got leftovers?? Turn them into a mouthwatering Philly Cheesesteak Pizza! Place your meat thermometer in the thickest part of your roast. Cook the roast in an oven preheated to 250 degrees until the meat reaches an internal temperature of 130 degrees. Remove the roast, and let it rest for 15-20 minutes before slicing. Do you have an approximation of how long it will take to cook an average-sized roast at 250? Trying to plan when to put it in! What kind of “marinade” did you use? Do you cut off the strip of fat off the bottom? My favorite way to make my favorite roast! I’ve tried it before and it doesn’t come out well…the texture is like that of a pot roast and just a waste. Made this tonight for dinner and it turned out to be the best roast I have ever made. I cooked mine until the temp was 140 and it was perfect for us. Thanks for sharing this recipe. Can’t wait to try the leftovers on a philly pizza, which is now on the menu. I was wondering what you did for Au Jus? Do you cook it covered or uncovered? 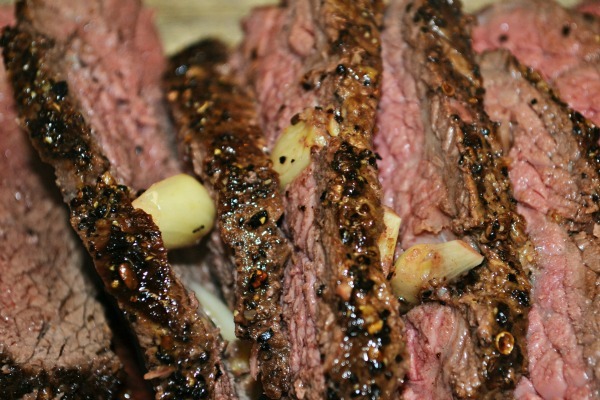 What steak seasoning do you use? I have started looking more closely at food labels and am trying to make things myself without buying pre-made marinades and seasonings to cut out all the extra mystery ingredients that I am sure are the cause of many people’s health problems these days. I looked at the ingredients of Lawry’s steak marinade and thought I can do this myself with the basic ingredients. 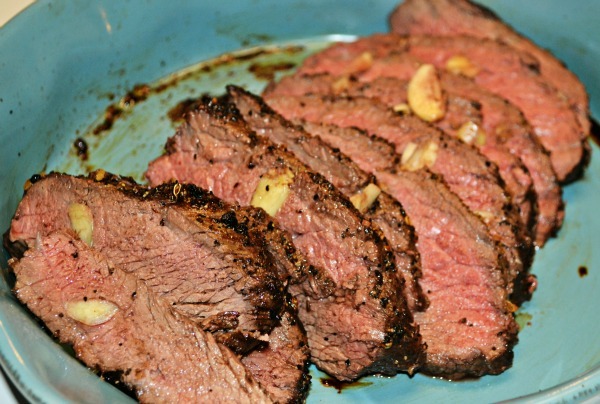 I just need a recommendation for a good steak seasoning and I will check out the ingredients and make it myself. Thanks! I don’t have a particular brand that I use honestly, whatever is on sale really! How do you spell Perfection? 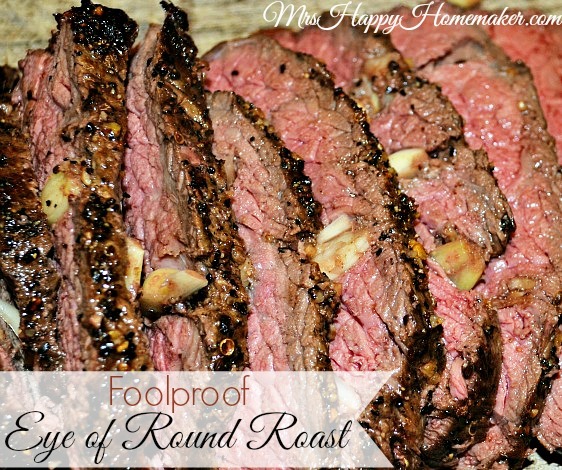 Foolproof Eye of Round Pot Roast! It was the best we have ever had. Will be our “go to” recipe for rare roasts every time! Thanks for the recipe. 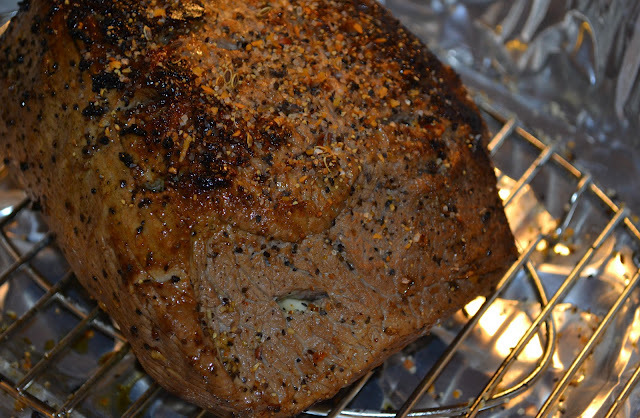 My 2-3 lb roast took about 2 hours btw. Delish!!!!! How long do you suppose it would take to roast 4 separate pieces 2-3 lbs each all at once? Delicious, came out perfect! Leftovers are better than the deli. I just made this for dinner it was amazing ,thank you for this amazing recipe.I also roasted some potatoes along with it. I made this last night, using a ‘rump roast’. 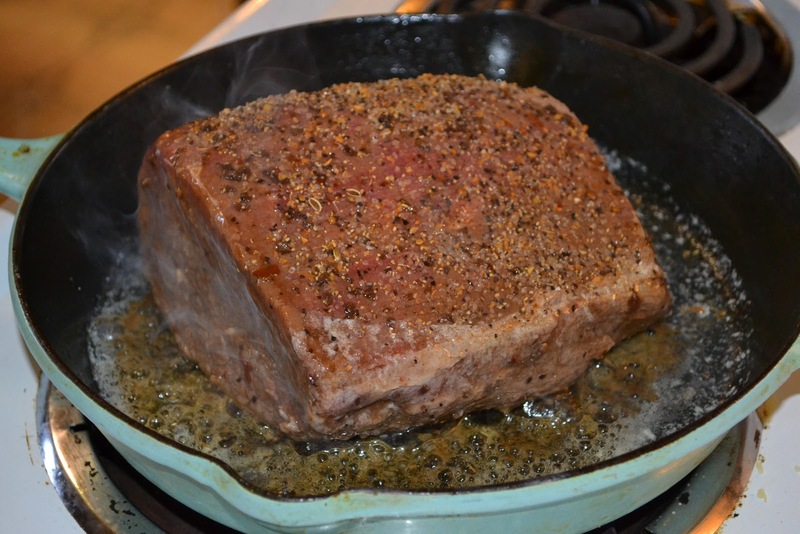 I used a garlic marinade (you can make your own marinade and steak-spice if wanted), and since the roast did not have much fat, I asked the butcher for a piece of fat for on top of the roast, so my pan drippings didn’t dry out. I roasted directly in the pan, and was able to get enough goodness from the pan to make quite a bit of great-tasting gravy. The insertion of the garlic cloves was a fantastic idea and added extra flavor to the meat slices. With 2 of your recipes under my belt, I will be trying many more – there are so many that look soooo good on your site! Thank you! I made this again tonight – ‘eye of round’ roasts were on special, so tried one of those (don’t think I have ever made one of those before!). Was quite different, and ohh sooo good! I think even better than the first time! The first time took a bit longer with the rump roast, and the meat seemed to need to be a bit better done, so this time, I did it a bit longer, but if (when!) I do again with eye of round, I’ll only roast until 130F. Can’t believe how simple and fantastic this is! 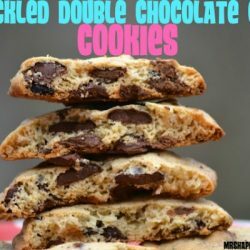 This is a great recipe, amazing tips! 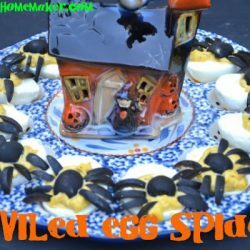 Can’t wait to try making this! This looks so juicy and delicious! I am trying your round roast recipe today. OK I am making this for My Husband and I’s 35th Anniversary dinner, Monday. I will let you know what the family thinks. Congrats!!!! Us too 35 years on the 26th! Maling mine for thanksgiving. Can I make this ahead? How would I re-heat and still have it be tender and juicy? I’ve never tried to make it ahead so I can’t really give direction on this. I’m sorry! 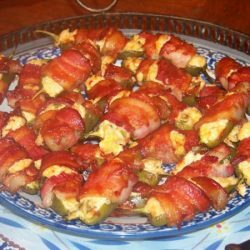 Making this the second time tomorrow. Amazing!!!! Tender, done just right, hubby, picky daughter and myself,, loved it! Thank you so much!